A scientific revolution began at the end of the 18th century with the creation and popularization of the graphic display of data by Scottish inventor William Playfair, who introduced the line graph, bar chart, and pie chart into statistics. 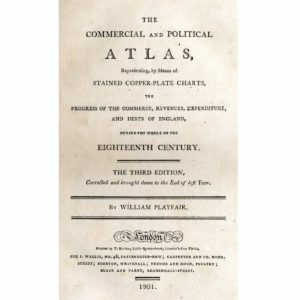 His remarkable Atlas demonstrated how much could be learned if one plotted data graphically and looked for suggestive patterns to provide evidence for pursuing research. In the Statistical Breviary, Playfair invented the pie chart and expanded upon this concept to facilitate the comparison of the resources of European countries. William Playfair (22 September 1759 – 11 February 1823) was a Scottish engineer and political economist, the founder of graphical methods of statistics. He invented several types of diagrams: in 1786 the line, area and bar chart of economic data, and in 1801 the pie chart and circle graph, used to show part-whole relations.